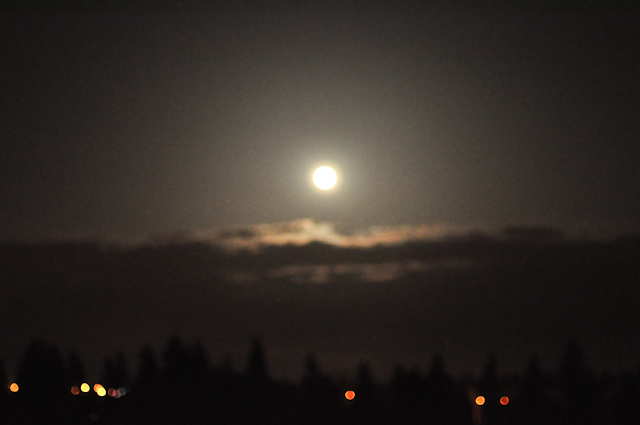 saturday night= hoodies and sweaters over pajamas, the pull of the super moon. we are a people who love super sized things. the shuffling down to the street corner, the looking, the waiting, the cursing of clouds. the super moon finally rising, bathing us in super moonlight. the shuffling back to the house, the arguing over which movie to watch, to microwave popcorn or not to microwave popcorn, the crowding that happens on the big green couch, the tangle of blankets and legs, lights off, all lights off, the glow and flicker of the television screen, the glow of the super moon outside. these are the kinds of things I want to remember. it was pretty amazing, that super moon. we had a family movie night that night too. it's the best. it was, it was. and perfect a night for a movie. not sure why. but perfect. I love this super moon so much! It sounds wonderful the way you described your super moon experience. I snapped some shots and slowly faded to sleep. Here is my photo if you'd like to see! slowly fading into sleep is my favorite way to do it. :) off to check out your super moon shot! my brother and his soon-to-be fiancee were over. we all pranced around in the yard under the moon. i think we grew antlers and hoofs for a little while. Love this! Ok now I want to know what movie won and was it any good and did it even matter? This definitely made me want to be more intentional with my TV watching, really do it up right with the atmosphere, popcorn, etc!